May Sinclair was born in 1863, and as the introduction to this VMC edition points out (the title page attributes it to Jean Radford, but DJ Taylor’s name appears afterwards on p. xi), she published her first novel in the reign of Victoria, and her final collection of stories ‘a few years short of George V’s Silver Jubilee’. That would be The Intercessor, and other stories (1931; the Jubilee was 1935). 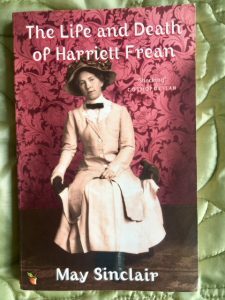 The point is that she has an impressive range of subjects and themes across her writing career, reflecting her experience of the socio-cultural and historical shifts in that span of time, from the height of British imperialism (she was an active suffragist on the home front) through WWI and its aftermath. May Sinclair is perhaps best known as an early Modernist writer, the one who is said to have coined the term ‘stream of consciousness’ to describe the narrative technique of Dorothy Richardson when reviewing the first volumes of her Pilgrimage sequence of novels in 1918. 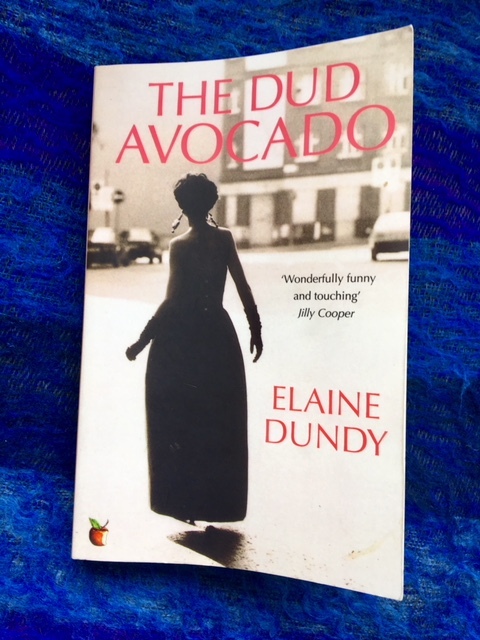 I see traces of that style in this novel, though for the most part it’s a fairly conventional narrative voice – just the odd moment signals her slightly more modernist tendencies. I’ll try to quote below to illustrate this. Her mother had some secret: some happy sense of God that she gave to you and you took from her as you took food and clothing, but not quite knowing what it was, feeling that there was something more in it, some hidden gladness, some perfection that you missed. Her father had his secret too. She felt that it was harder, somehow, darker and dangerous. He read dangerous books: Darwin, and Huxley, and Herbert Spencer. Sometimes he talked about them. The voice here (like James Joyce’s in the early pages of A Portrait of the Artist as a Young Man) takes on some of the naïve tones of the young Hatty, as she considers her parents with the partially formed, excessively admiring appraisal that cause her to over-invest in the Victorian moral certainties of both parents, while failing to discern the defects and underlying hypocrisy. It’s a subtle technique, for her narrating perception here is unreliable; yes, the father does ruin the family with his reckless gambling on the markets, but a few paragraphs later Hatty concludes that ‘His thinking was just a dangerous game he played.’ Events prove her sadly wrong. Although her blind faith in her father is shaken, she never stops thinking of him as a paragon, or to remind her friends that she is Hilton Frean’s daughter, as if this in some way endorses her arrogant air of superiority. She never stops to consider that other people’s lack of respect for such assertions has anything to do with the faults in her family – or in her own perception. The tragedy of this sad figure, then, is that she accepts unquestioningly the values of selflessness and self-effacement that she was taught to esteem. As the years pass she becomes ever less able to understand why she’s so unfulfilled or fails to inspire the respect and devotion in others that she feels for her parents, and for their ‘idea of moral beauty’. By denying herself, as they have taught her, the happiness that comes her way, she condemns herself to a life of loneliness and increasing despair. But the beauty of that unique act no longer appeared to her as it once was, uplifting, consoling, incorruptible. For that’s the point, isn’t it? Her belief that she’s ‘not thinking of herself before other people’ is in reality an act of pride and arrogance, a sin against the laws of nature. There’s a May Sinclair Society whose site is worth a look. I owe this literary find to Dr Oliver Tearle, who warmly recommended Harriett Frean at his always entertaining site Interesting Literature back in January. Despite the surface triviality, there’s something else in Barbara Pym’s novels (links to my other posts at the end), a darker seriousness, a moral frailty or ambiguity. OK, on class and social convention she can be pretty starchy – but even then she’s often surprisingly barbed and acerbic. The parish hall teas, clerical gossip and frettings about high-church rituals and practices are the froth at the top of a bracingly bitter cappuccino. I was pleased at his compliment for I always take trouble with my clothes, and being tall and dark I usually manage to achieve some kind of distinction. Today I was in pale coffee brown with touches of black and coral jewellery. Rodney seldom commented on my appearance now and Piers had that engaging air of making me feel that he meant what he said. I was sorry when we came to a crossroads and he said he must leave me. This revealing passage is typical of Pym’s mastery of that narrative voice that hints more about what Wilmet fails to note than what she does. It shows she’s vain and bored enough to feel flattered here, assuming that any man who’s complimented her must have taste – and there’s that indication that her civil servant husband Rodney, who’s becoming bald and stout, fails to show the romance and attentive spontaneity Wilmet craves. It will come as no surprise, if I can avoid spoilers, that her views about such admirers are badly misjudged. Not for nothing does the dashing Rocky Napier, who featured in Excellent Women, represent in Wilmet’s nostalgic recollections of her more exciting past as a Wren in wartime Italy the kind of dashing, dastardly and good-looking type that she likes to fall for – only later to be disappointed. 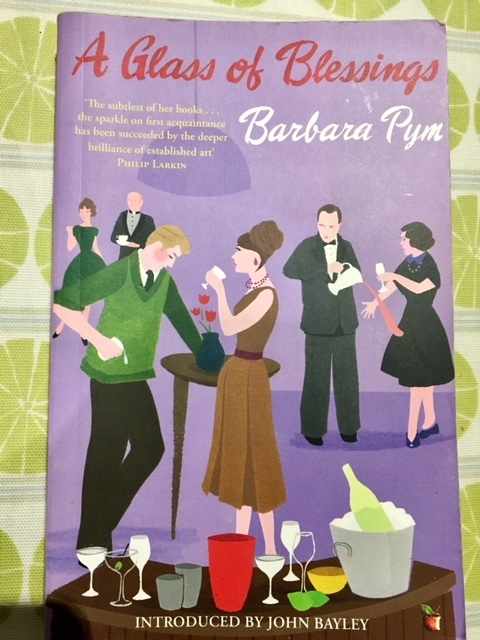 The title of A Glass of Blessings, as revealed near the end, comes from one of those poems Pym’s women characters are fond of quoting, in this case ‘The Pulley’ by George Herbert. Wilmet has sought diversion from her idle routine by attending the local Anglo-Catholic church, and much of the novel involves her discovering the secrets and foibles of its clergy and congregation. 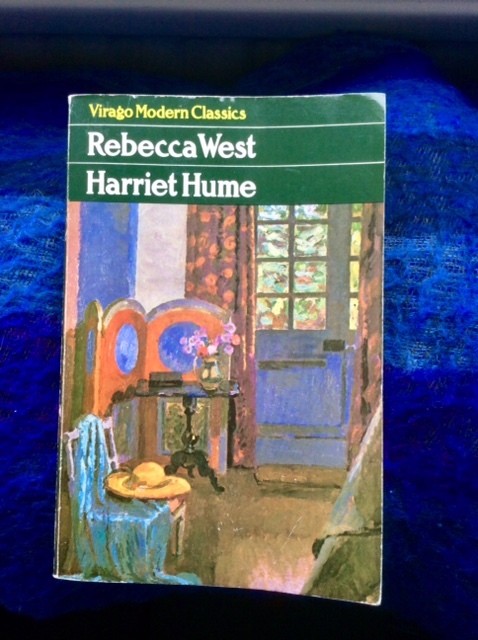 It’s this aspect that provides most of the novel’s delightfully skewed humour, from the kleptomaniac, camp Bason, the housekeeper/cook for the celibate priests, to Mr Coleman, too fond of the tailor-made silk cassock he affects when serving in church ceremonies, and of his Husky (a make of car, not, as Wilmet vaguely assumes, a ‘large polar dog’). These beautifully sketched characters are deployed with poised, spiky skill by Pym; the plot is secondary to this parade of minor egotists and misfits. In Herbert’s poem God generously bestows all those ‘blessings’ from his glass, with only ‘rest’ left in the bottom. This he withholds, realising that if he gives humanity this, they will tend to become complacent, and both will ‘lose’. This is the lesson Wilmet learns: to be content with what she has, and appreciate her ‘repining restlessness’ for what it teaches: be more aware of her weaknesses, and more attentive in her relations with other people. She’s far too quick to judge others by their appearance, and complacent about her own moral rectitude because she looks good. Her name is taken from the massive family saga The Pillars of the House by now-neglected Victorian novelist Charlotte M. Yonge, who was, like Pym, high church by inclination, and surprisingly frank about all varieties of sexual inclination – as indeed Pym is in this novel. 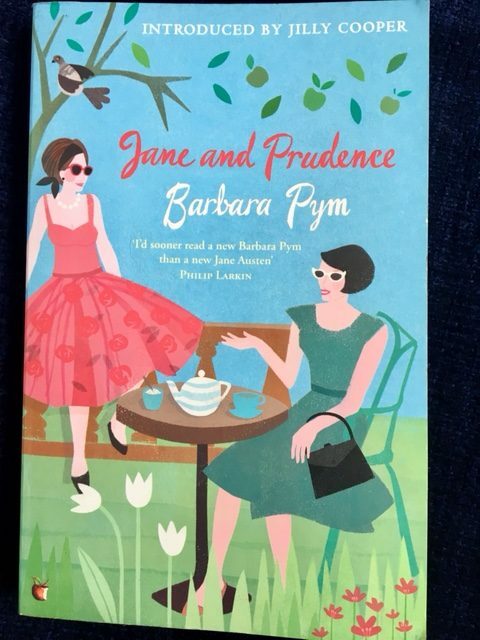 Another interesting factor in a Pym novel: literary allusions, like clothes, reveal a great deal about character (apart from Herbert, Woolf, Ivy Compton-Burnett, Donne and Marvell, for example, are alluded to in this way in the narrative). Wilmet indulges a suspicion that another handsome young man – the new assistant priest – fancies her; another harsh lesson in self-knowledge is administered when she learns with astonishment that ‘dim and mousy’ (as Wilmet sees her) Mary Beamish has become engaged to him. It’s to Wilmet’s credit that she quickly reproaches herself for such an ‘unworthy thought’. Every time she shows herself as snobbish, she redeems herself with her immediate sense of shame. Perhaps I had never really known him, or – what was worse – myself. That anyone could doubt my capacity to love! That ‘perhaps’ is brilliant, and so is the exclamation mark. She goes on to concede that perhaps she’s not as ‘nice’ as she’d thought, and might really be ‘rather a horrid person’ – and this is ‘humiliating’. It’s her Emma and Miss Bates moment. Despite such defects in her personality, Wilmet engages one’s interest and sympathy. 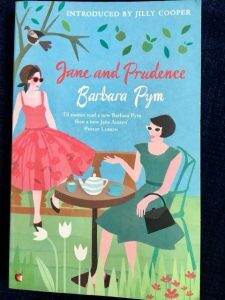 Pym never judges her characters, and she leaves us with the sense that we are all of us as flawed and ‘restless’ as Wilmet. I had hoped to write about the importance of clothes and appearance, but I’ve been forestalled by this excellent, detailed essay by Sandra Goldstein; I recommend it. There’s a lot of interesting, sharp observation about the self-centred pomposity of men and their selfish way of taking their long suffering womenfolk for granted. When she’s being clear-eyed Wilmet sees them at a cocktail party as they mostly are: ‘sheepish’, then more like ‘bears’ or snuffling badgers. Unfortunately she loses perspective when they flatter her vanity. A whole different post could be written about the wonderfully dry, shrewd Sybil (aptly named), Wilmet’s mother-in-law (she announces at the end of a dinner party, as the women are about to leave the men to drink their port: ‘Women are supposed not to like port except in a rather vulgar way’); maybe she’s meant to represent what Wilmet might grow up to be like when she reaches her late sixties and has learnt more about herself, men and life. Elizabeth Taylor, Angel. 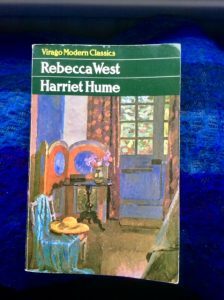 First published 1957; my edition: Virago Modern Classics, 2013.
had removed herself, romantically, from the evidence of her senses: the reality of what she could learn by touching, tasting, was banished as a trivial annoyance, scored out as irrelevant. These adolescent fantasies develop into her badly written stories as antidote to her drab, squalid life above a grocer’s shop in a dismal slum in a bleak industrial city. It’s a novel that’s as bitter about the dreadful taste of a reading public that makes Angel a fortune from her scribbling as it is about the awful, exposed solitude of the writer’s life. Perhaps that sounds a bit grim – but it’s a very funny, beautifully written book. From the opening words, when we’re treated to the only direct quotation in the novel of Angel’s execrable, purple prose style – an extract from a story written for her teacher (though it’s a style imitated viciously by one of her subsequent publishers) – it’s clear that Taylor has created a deliciously outrageous monster. She doesn’t believe I wrote it, she thought, glancing with contempt at the flustered little woman with the slipping pince-nez and bird’s-nest hair. Who does she think wrote it if I didn’t? Who does she think could? What a way to spend your life – fussing about with school lessons, getting chalk all over your skirt, going home to lodgings at night to work out the next day’s Shakespeare – cut to page this, line that, so that we don’t have to read the word ‘womb’. 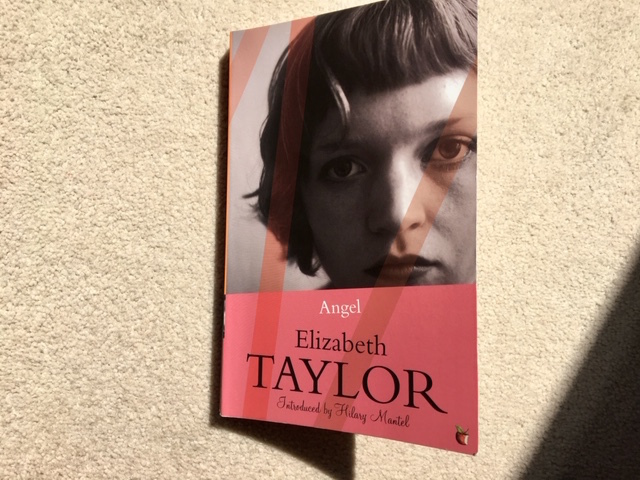 The narrative voice has the wit, insight and sharp eye for detail that is all Taylor; Angel would never be capable of that selective kind of descriptive detail. But it’s a voice that also accurately expresses the viciousness and arrogance of the schoolgirl who so despises this harmless, commonplace teacher. It foreshadows the sheer nastiness, narcissism and intolerant cruelty that Angel displays throughout her life whenever someone criticises her work (which is clearly terrible), or has the temerity to challenge her fiery, rude and obstinate behaviour. It’s perhaps this aspect of the novel that’s so brilliant. Anyone who’s ever aspired to write has to deal with the conflicting emotions brought about by the critical comments of those who read their work. Angel has such a wilfully inflated, delusional view of her own brilliance that she’s incapable of accepting criticism gracefully, or of learning from it. She believes she’s perfect, so improvement is a logical impossibility in her view. Maybe there’s something in this mixture of ‘great vanity’ and self-belief that all aspiring writers experience, but rarely admit to. …these letters gave her a sense of power and she enjoyed reading them…she did not write for children. Letters which merely made carping criticisms, about flowers coming out in the wrong season, Orion appearing in the night sky in August, or some confusions with Greek deities, she put down as the work of literary critics, a part of their general scheme against her. Typical of Angel, to make the expression ‘literary critics’ into an expletive (as ‘do-gooders’ or ‘anti-fascists’ are for extreme right-wingers). And notice that it’s ‘confusions’ and ‘deities’, plural! That hint of paranoia, too. Wonderful. When her husband roared with laughter on reading this, Angel ‘looked at him in amazement which changed to cold disdain.’ She can’t understand why he finds it – and her – hilarious, and then she feels sickened and angry; ‘he must be mad’, she concludes. The London EC4 postmark ‘meant nothing to her’; her vanity exceeds her boundless ignorance, for it is, of course, that of Fleet Street and the heart of English publishing. 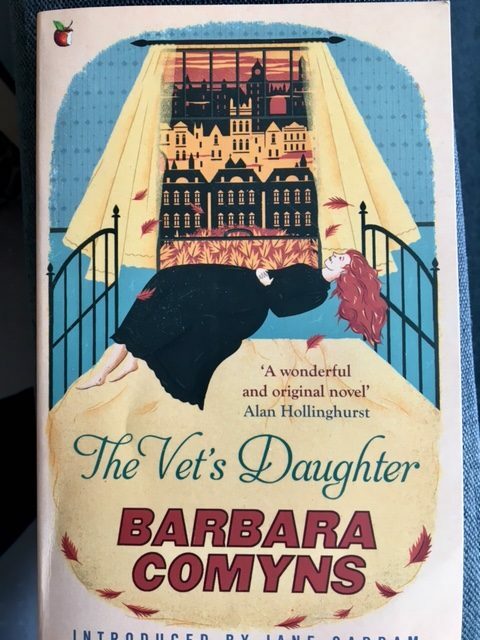 This is not a review of Barbara Comyns’ fourth novel, The Vet’s Daughter, published in 1959 (she died in 1992). 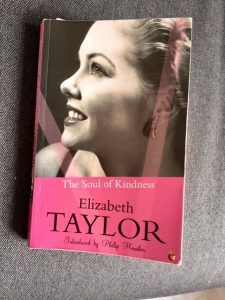 I’ve written about two of her others in previous posts (links at the end), so have I think already established the nature of her highly idiosyncratic approach to narrative voice, plot and character dynamics. All tend to be at the same time naive, deceptively simple, yet also dark, tending towards a kind of surreal gothic, and skewed in their world view. Odd things are narrated as if they were everyday; the banal is often rendered extraordinary. All I need to do to give an idea of The Vet’s Daughter, then, is to quote from its opening page. A man with small eyes and a ginger moustache came and spoke to me when I was thinking of something else. Together we walked down a street that was lined with privet hedges. He told me his wife belonged to the Plymouth Brethren, and I said I was sorry because that is what he seemed to need me to say and I saw he was a poor broken-down sort of creature. If he had been a horse, he would most likely have worn kneecaps. We came to a great red railway arch that crossed the road like a heavy rainbow; and near this arch there was a vet’s house with a lamp outside. I said, ‘You must excuse me,’ and left this poor man among the privet hedges. This man possibly reappears in the penultimate page for no explicable reason, just as the encounter with the teenage vet’s daughter here simply serves to show the apparent randomness and lack of agency in her life. Why bother to tell us about those privet hedges? Or that the ‘poor man’ is to be pitied because of his wife’s religious persuasion? How bizarre that she should liken his condition to that of a horse with kneecaps (do they wear such things?) If so, why does he resemble one thus attired, rather than just a regular, naked-legged horse? Is it because they live a life of toil and drudgery? Maybe she’s projecting on to him something of her own miserable existence with her tyrannical, sadistic father. Maybe, like Stephen King, she’s establishing a suburban setting of ordered tranquillity and banality – the hedges, the railway bridge, the lamp – in order that the domestic horrors to come are all the more upsetting. That ‘heavy rainbow’ simile is good. There is no magical crock of gold at its end, of course. Quite the opposite, as the next paragraph begins to show. I entered the house. It was my home and smelt of animals, although there was no lino on the floor. In the brown hall my mother was standing; and she looked at me with her sad eyes half-covered by their heavy lids, but did not speak. She just stood there. Her bones were small and her shoulders sloped; her teeth were not straight either; so, if she had been a dog, my father would have destroyed her. Although this narrating voice seems like that of a naive child, then, there’s a highly sophisticated literary sensibility at work here. That use of ‘although’, seemingly irrelevant, implies that either there is carpet – which would absorb and retain animal smells – or bare floorboards – which suggests parsimony in the head of the house. Or else the disconnectedness of the clause reflects that in her consciousness, all sense of normality and rational connection had been shattered or diminished by her father’s despotic control. The hall’s brownness connotes a dismal, squalid colourlessness and lack of joy and love – a state that rapidly becomes frighteningly evident. The sadness of her mother’s eyes, her speechlessness, slight build, the slope of her shoulders: all demonstrate heartbreaking vulnerability in this hall of misery. We soon learn, too, that her teeth have been knocked askew by her abusive, violent husband. He’s a monster of fairytale-ogre proportions. This is also hinted at in that closing sentence: he’s a vivisectionist’s supplier, quick to have sickly animals ‘destroyed’ – a category in which he includes his long-suffering wife and daughter. I’m not sure I can say I enjoyed this novel. Its bleak picture of a psychopathic husband and father, portrayed by a voice so gentle and unassuming, makes for almost unbearable reading at times. How galling it must have been for Sylvia Townsend Warner to hear people like her mother praise this impassioned protofeminist novel Lolly Willowes for its whimsical depiction of spinstery witchcraft in the Chilterns. So much has been written about the plot, I won’t précis it here. 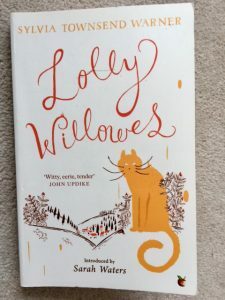 There’s a succinct account and appraisal in Robert McCrum’s recent piece in the Guardian’s ‘100 Best Novels’ series (he places Lolly Willowes at no. 52), emphasising how it’s much more than a charming fantasy: it’s about a repressed, disregarded woman’s quest for personal freedom and for meaning in her life – without being beholden to any man, religion or social class or institution. 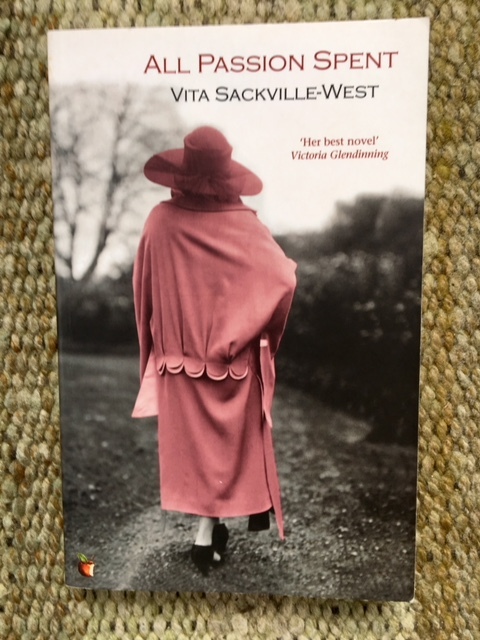 Sarah Waters’ introduction to the Virago Modern Classics edition – the one I’ve just finished – is found online, again at the Guardian website. 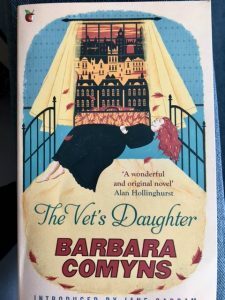 It gives an excellent analysis of the novel’s impassioned themes of a woman’s struggle to be free in a patriarchal world soon after WWI, when the slaughter in the trenches was still a recent memory, and women’s new-found independence was being suppressed again, as it was in the Victorian and early Edwardian period. Waters astutely positions the novel in a literary group containing both Lady Chatterley’s Lover and Virginia Woolf’s ‘A Room of One’s Own’. Instead, she argues, women become witches ‘to show our scorn of pretending life’s a safe business, to satisfy our passion for adventure.’ This long section towards the end of the novel is one of the most powerful expressions of feminist polemic I’ve read in a work of prose fiction (Nora in A Doll’s House would understand Lolly implicitly). Women have such vivid imaginations, and lead such dull lives. Their pleasure in life is so soon over; they are so dependant on others, and their dependance so soon becomes a nuisance…And all the time being thrust further down into dullness when the one thing all women hate is to be thought dull…[On Sundays they are required to listen to church sermons on Sin, Grace:] All men’s things, like politics, or mathematics. Nothing for them except subjection and plaiting their hair. What an act of wilful misreading by the author’s mother to see that as anything but a subversive call to feminist arms. Sadly, it’s a message still relevant today.